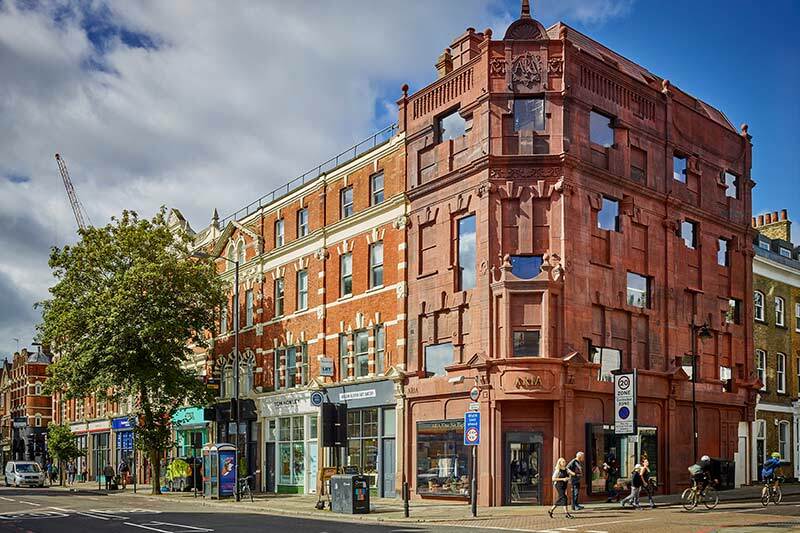 168 Upper Street is situated on the north corner of the parade of buildings between Waterloo Terrace and Barnsbury Street. This delightful architectural conundrum fits comfortably into its natural surroundings. The historic building continues to provoke intrigue with its many distinctive architectural features. The building had remained empty since it was bombed during World War II. Its redevelopment was completed in 2017. 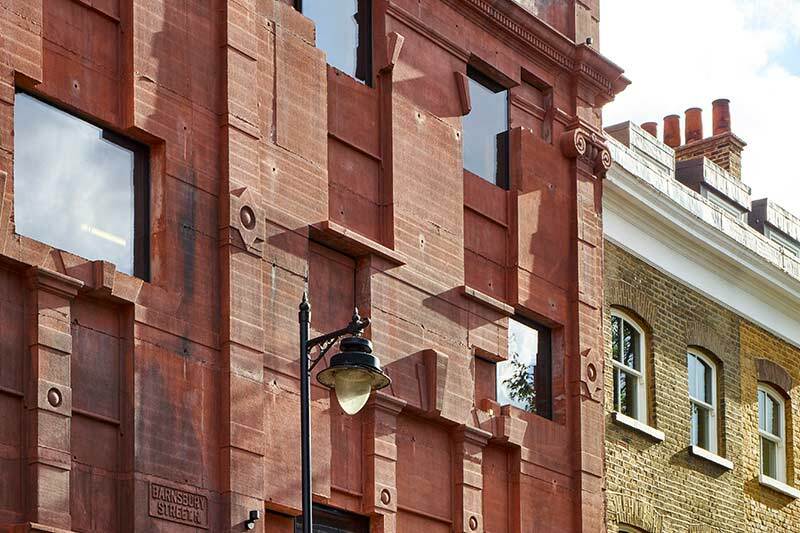 The redesigned building, by Groupwork + Amin Taha, now features intricate external mouldings and attractive window surrounds, as well as fine internal skirting, dado rails, and cornices. 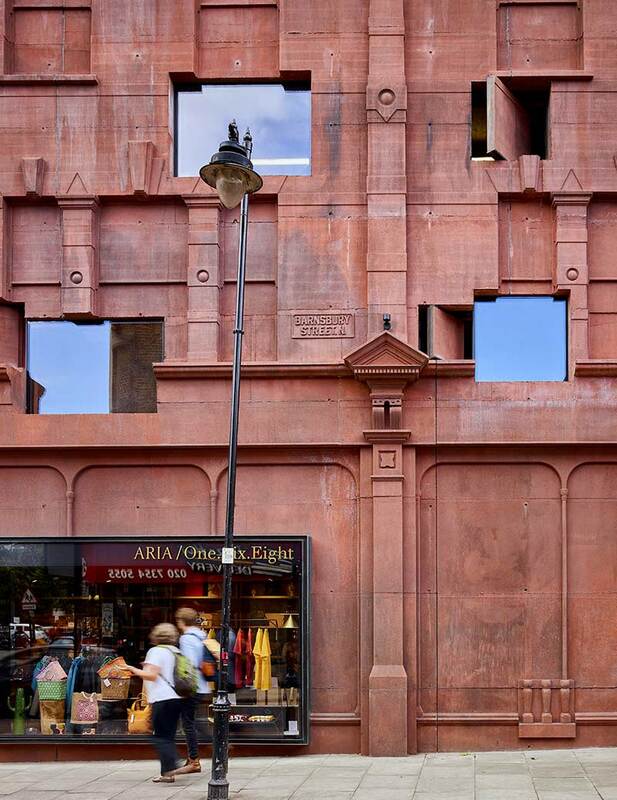 The external façade is constructed from cast terracotta to form a half metre-thick wall that reminds us of the building’s previous life. 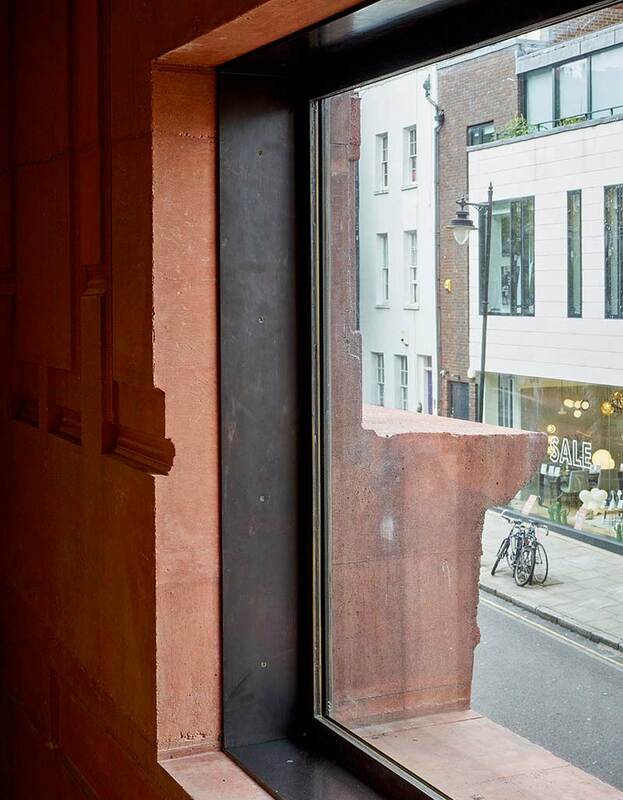 Featured within the external façade are bespoke patinated brass windows and large terracotta pivot doors, all supplied by Glasstec Systems, one of London’s leading architectural glazing companies. The project’s prescribed performance criteria set many challenges for the team. Glasstec Systems are renowned for their creativity and problem-solving skills, specialising in bespoke glass solutions. The visual impact of the glazing solution in this prominent location was key to the success of the project. Glasstec Systems’ design team overcame a number of installation challenges, ensuring that each glass panel now features low iron insulated glass., some of which weighed over 400kg. “Our skilled metal worker, Alan Cowley and team deserve credit for their dedication to perfection. Seeing the brasswork up close is truly something to behold. The architect’s persistence in his choice of brass as a finish is borne out. The aging process provides an undoubted richness of character. Glasstec Systems’ experienced and highly skilled glazing team managed the work throughout, including the use of modern lifting equipment. The team worked in tandem with the main contractor to ensure that the installation was completed smoothly, on time, to deadline, within budget and without fuss. The Glasstec Systems team has combined industry experience of over fifty years. They specialise in providing ‘hands on’ bespoke structural glass solutions, taking the job from the initial enquiry stage all the way through to the sign off stage on site. Integral to the success of Glasstec System’s business is its focus on customer service, gaining approval throughout while providing forward thinking, cost effective products and service. Glasstec is a progressive company. Lauren Cass (Director) and Rhea Cass (Office Manager) are fundamental to the smooth running of the business. Having senior female figures spearheading a business management team is unfortunately all too rare in the UK construction industry. The company is known for its fully committed approach to the projects they take on. Glasstec’s qualified experienced team members are always happy to work from the initial design stage offering advice where needed, presenting possible structural glazing solutions as required, as well as advising on those proposals that might not be possible! Because Glasstec Systems expertise is cutting edge, the team are often asked by architects for advice on glazing solutions. “We like this design/structure, but how do we do it in glass?” is a common question they are happy to answer.